This is a sponsored post. We are being compensated to share our experiences at Liberty Science Center. As always, all opinions are honest and solely of JustaBXfamily. We ventured out to NJ over the weekend because MomTrends invited us to spend the day at Liberty Science Center with a few of our other favorite bloggers. I was really surprised at how easy the commute there was. Granted we had to take three trains but they were all easy to catch, little wait times and left us very close to our destination. I’m sharing this because I know for us NYers traveling primarily on public transportation leaving the City can be a scary idea. Don’t let this fear stop you from checking out a really cool place. It truly seems like this place was designed with my little in mind. There are dinosaurs, gross body sounds and smells, insects and space exploration. Yup, many of her favorite things found in one location. You bet we spent the full day there. We arrived at 9a just as Liberty Science Center opened and left around 3p. We didn’t see everything but we were trying to beat the rain so I promised her we would return soon to check out the rest. I’m challenging you to get there soon so you don’t miss the featured exhibitions that are there through various dates in September. Grossology: The (Impolite) Science of The Human Body was a huge win with JustaBXgirl. She loved the grossness behind the science. Watching giant mucus hang low, manning a barf machine and smelling disgusting body odors were some of her favorite parts of this exhibit. I enjoyed that there was something for all ages. The younger littles could enjoy sliding down an esophagus while the bigger littles could play a human-sized game of Operation. There was so much knowledge to be read and it was delivered in a way that littles were excited to learn. This exhibit runs through September 23rd. Arthur’s World is geared towards the littles that watch the show. It’s exciting to see Arthur’s home and class come to life. Don’t think though that this is just for the tiny littles. JustaBXgirl doesn’t watch the show but she had a heap of fun cooking in the kitchen, giving her friends detention in the classroom and engineering the shows in the auditorium! Oh, and don’t forget camping in the backyard. JustaBXgirl told us, no adults allowed! You can catch this exhibit through September 16th. If your little is into building make sure to check out the Block Party happening through September 30th. You and your littles can build using blue foam blocks or classic wooden blocks. This was definitely a popular place to be when we were there. I suggest hitting this exhibit early because if you wait for the afternoon it gets crowded. Future paleontologists CANNOT miss the seasonal Dino Dig at Liberty Science Center. I’m not sure if you’re aware but JustaBXgirl has had a fascination with dinosaurs pretty much her whole life. Her favorite dinosaur used to be a triceratops, which you will find in the dig. Now though she is more into pterodactyls. You can uncover more than sixty fossils in the Dino Dig. And these aren’t cheap plastic bones. These are museum quality replicas, many of which are the same types discovered by Jack Horner, the paleontologist who inspired Jurassic Park. JustaBXgirl enjoyed this exhibit so much we visited it twice! She also asked if me and her can go to school together and become paleontologists to find our own dinosaur bones. Another highlight of our day was visiting the Jennifer Chalsty Planetarium. JustaBXgirl also loves learning about planets and has begun studying them at school. This was a great way for her to connect what she has already been introduced to by her teachers. It was also a great way for her to share information with me so that I can see she had really absorbed the lessons. I also left knowing her favorite planet is Jupiter! We got to check out To Worlds Beyond: Journey Through The Solar System. This was a very informative 35-minute movie that took us on a tour through our solar system. It was a little long for the littles, even ones with an interest in outer space exploration but it is filled with so much really cool information about each planet. Younger littles might enjoy the One World, One Sky: Big Bird’s Adventure more. Either way though this planetarium is not one to miss. Did you know it is the fourth largest planetarium? The only larger ones are in Japan and China. JustaBXgirl was really excited to see that there were animals and insects at Liberty Science Center. We got to visit a working beehive and search for the queen bee. We saw ants busy carrying food and leaves through their colony. Got to check out naked mole rats, something we have only seen on shows like the Wild Kratts and so much more. When we were leaving Liberty Science Center, JustaBXgirl told me that she had more fun than she expected to have. She said she enjoys science but thought it would be too sciencey for her tastes. She continued to share that yes, there was science and learning but it was so much fun. Guess, it was another day of us avoiding the summer slide! Now we want you to have as much fun as we did. 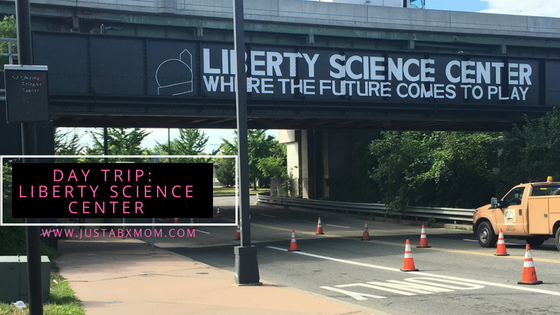 We are giving away a pair of passes to check out Liberty Science Center on your own. These are general admission passes and do not include premium exhibition, planetarium or film admission. Simply leave a comment below on which of the exhibits mentioned would make your must see list. OMG a dino dig I need to go do this asap. Such a fun day. Great recap. We had a good time too! Liberty Science Center has been a favorite of mine since I was a kid. It was nice being able to share a bit of my childhood with my daughter. It was fun sharing my first time there with my daughter. We both had so much fun.